I just wanted you to know that I really enjoyed the trip. 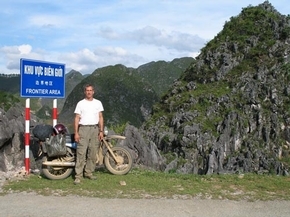 I was a little concerned about doing a second ride through the northern part of Vietnam but the scenery was so impressive (almost surreal) and so different from my first trip that my concerns quickly evaporated. And, as if the scenery wasn't enough, the ride itself was awesome - the roads we traveled were made for a motorcycle! Also, the guide did a great job. I enjoyed traveling with him and he did an excellent job keeping the bikes running. I will be back in October or November and would be interested in the Laostrip so please keep me posted. Is it possible to do a run past the Plain of Jars (and maybe over to Vietiane)? Let me know what you are planning and why you call it a HELL trip - you must have known that would peek my interest right away!